France and Britain were international rivals seeking wealth and power. This competition affected Virginia, as well as islands in the Caribbean and India. England, France, Spain, the Netherlands, and even Sweden fought each other overseas in North America and he Caribbean, without formally declaring war and risking invasion of the homelands in Europe. The French and Indian War was fought in North America between 1755-63 by French and British forces (including colonial militia). The "Indian" part of the name is key to understanding the conflict. Native Americans chose to ally with either England or France. 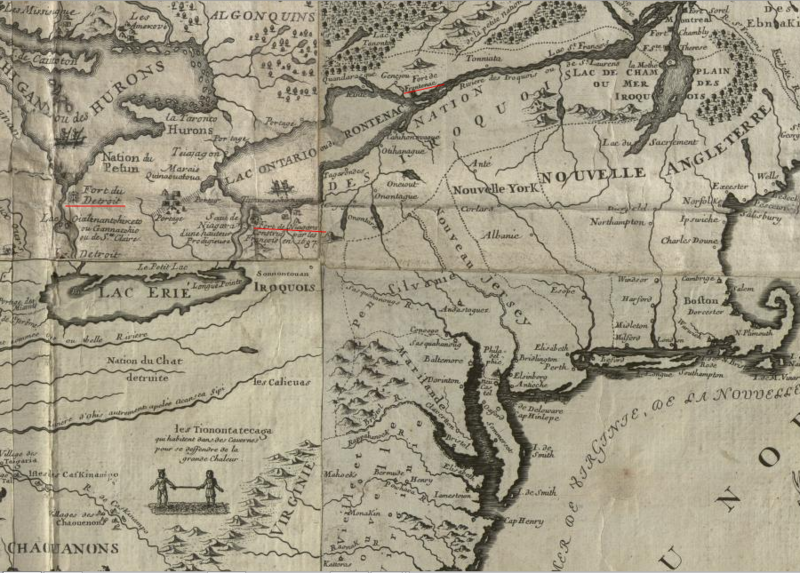 Competition for their trade and support created conflicts that extended far from the cities of Montreal and Quebec along the St. Lawrence River, and from the English settlements on the Fall Line. The war was one of a continuing chain of English-French conflicts in North America, stretching back to the earliest settlements by the European rivals. Starting in the 1500's, the French had relied upon various Native American groups living within the interior of New France to hunt and process deer skins and furs, then exchange them with other tribes further east. French ships traded for beaver and other skins at Tadoussac on the St. Lawrence River downstream from Quebec, which Samuel de Champlain started in 1608. 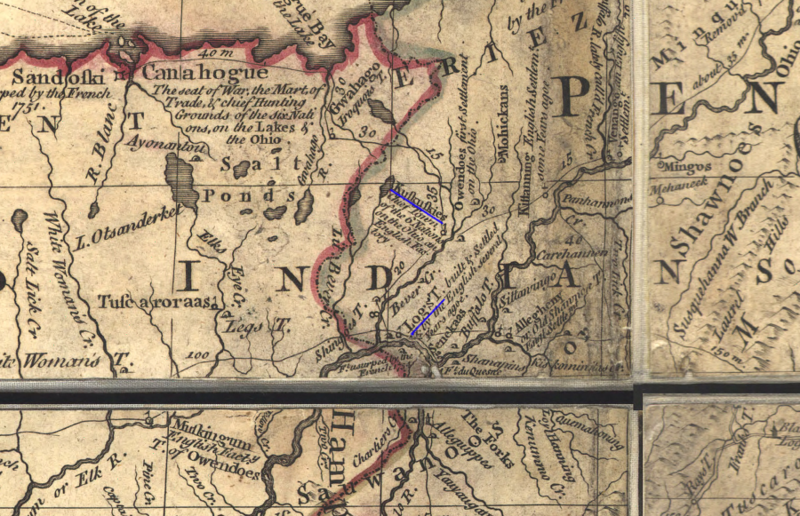 In the Great Peace of 1701, the Mohawk and other members of the Five Nations (the Tuscarora did not join until the 1720's) agreed to stop fighting the French on their northern border. This freed up the Iroquois to combat the Mahican on the east, their rivals for trade with the Dutch fort at Albany. Peace with New France also allowed the Iroquois to focus on conquering the Susquehanna and Delaware to the south, plus westward expansion to establish Five Nations hegemony over tribes living in the Ohio River valley. The French built Fort Detroit in 1701, extending their trading network further to the west. 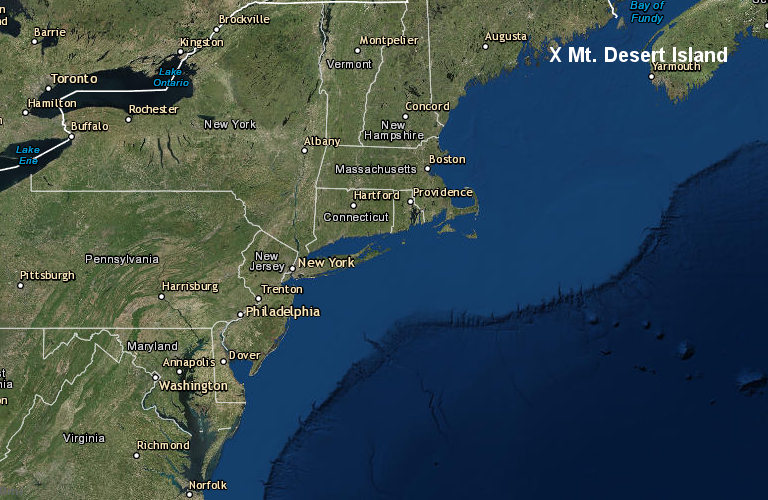 It was located on territory that Virginia had claimed since 1609.
unto the said Treasurer and Company, and their Successors... all that Space and Circuit of Land, lying from the Sea Coast of the Precinct aforesaid, up into the Land throughout from Sea to Sea, West and Northwest. In contrast to the economy established by the French based on fur trading, English colonies in North America were based on agriculture. Virginia and Maryland relied upon one staple crop, tobacco, which depleted nutrients in the soil within three years. To find fresh land to plant tobacco, English colonists displaced Native American tribes. 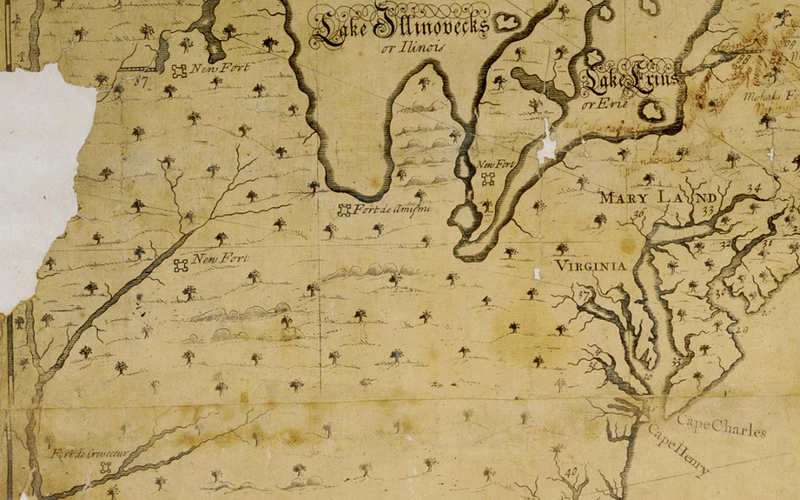 Occupying their land and preventing traditional hunting practices led to conflict, and a desire of the colonists to push Native Americans out of Virginia. The sale of tobacco to customers in Europe generated profits for business leaders in London. Taxes on tobacco generated an extraordinary profit for the English government. Land speculation steadily fueled the growth of a wealthy gentry class in Virginia, though the price of tobacco grown in the Middle Atlantic colonies varied based on supply, demand, and manipulation of the market by London businessmen. The colony's gentry dominated colonial government in Virginia, and the colony's economy was based on a ever-growing population continuously buying western lands. The colonial government located in Jamestown and then in Williamsburg (after 1699) granted those lands at low cost to a select group of powerful families. They profited by displacing Native Americans and selling parcels to new farmers. Growing tobacco was profitable, but the major fortunes of the First Families of Virginia (FFV's) were made from land speculation. That land speculation by Virginians, more than any other colony, was the fundamental cause of the French and Indian War. Full-scale conflict in the New World between England and France had been delayed 200 years, in part because the two countries initially separated their colonies by great distances. However, as English settlement expanded into the trading backcountry that fed furs to Montreal and Quebec, competition for trade with Native American tribes increased. The efforts of the Ohio Company to occupy lands at the Forks of the Ohio River finally triggered the war which determined which European power would control the interior of North America, east of the Mississippi River. There was a long tradition of warfare between French colonists and Native Americans, pre-dating the settlement at Quebec in 1608. Warfare between English colonists and Native Americans started in the first days of Jamestown. Various groups of Native Americans resisted efforts by colonists to convert their towns and hunting territories into farms. Per-capita incomes in New England did not recover their 1675 levels until 1775... A large share of the capital of the puritan fathers... had been consumed in the fires of King Philip's War. 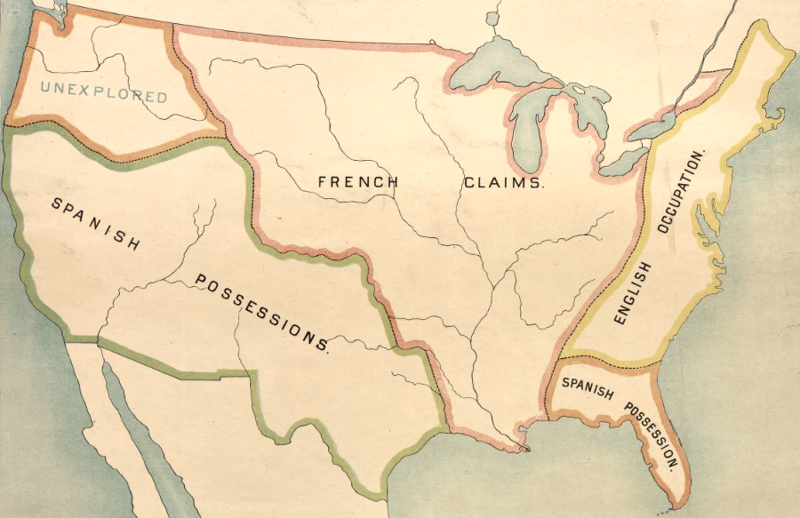 Throughout the first half of the 1700's, conflicts between France and England in Europe overlapped with European and Native American rivalries for control of land and trade in North America. Iroquois expansionism, fueled in part by skillful negotiation of alliances with colonial representatives of France and England, forced the Susquehanna and Delaware out of their traditional territories and made them dependent upon the Six Nations. West of the Ohio River, the Shawnee were the most willing to assert their independence of the Iroquois. The Erie, Mingo, Wyandot, Ottawa, and other tribes were forced to acknowledge the power of the Six Nations. In negotiations, dependent tribes were forced to accept arrangements acceptable to the Iroquois, and leaders of subordinate tribes were designated as only "half kings." The Ohio Company's disruption of relationships in the backcountry of the Ohio River valley started in the late 1740's. Speculative land claims by that company was just one of many disputes between France and England; the conflict could have become just another minor event in a long pattern of conflicts. The overlapping territorial claims by the French based on the St. Lawrence River, and by the English speculators based in Virginia, grew into a decisive world war because the buffer of undisputed land between New France and the English colonies finally had been exhausted. The Ohio Company intended to occupy the backcountry of the French traders and block their economic opportunity. The French refused to concede the valley of La Belle Rivière, and maneuvered to dominate the Native Americans who lived there. 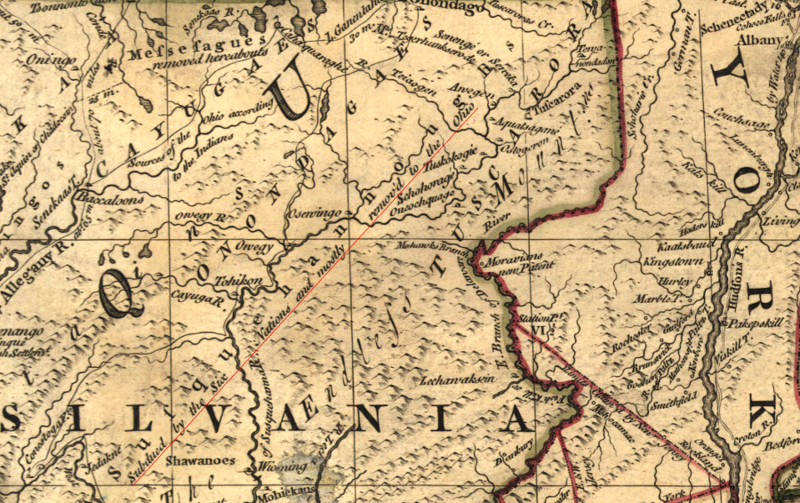 The traders from Pennsylvania sought to have Native American groups interfere with traders from Virginia and vice-versa. The colonial governors failed to work together to implement a common negotiation strategy with Native American tribes. Choosing a time for the start of the French and Indian War requires assessing the events that preceded official declaration of war in 1756. King George's War started in 1744, and ended in 1748 with only a temporary peace. 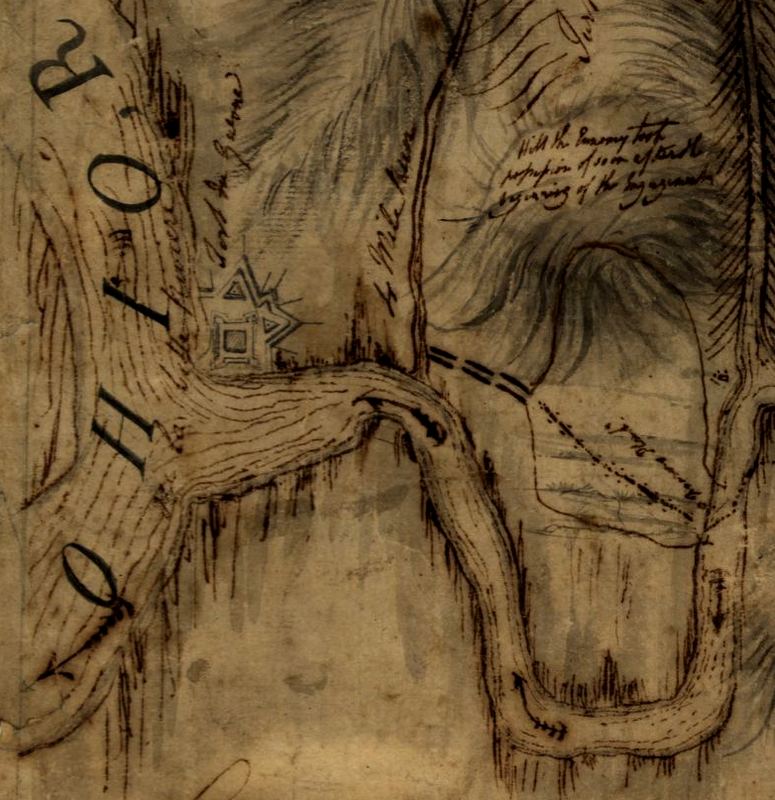 In 1754, open conflict re-started in North America at the Forks of the Ohio. In 1756 the two countries started the Seven Years War in Europe. That led Great Britain to send enough military forces from Europe to North America to tip the balance, and in 1763 France was forced to abandon North America. In 1753, the French established military bases on the southern edge of Lake Ontario and in what today is northern Pennsylvania. In late 1753, Lord Dinwiddie sent George Washington to notify Legardeur de St. Pierre at Fort de la Rivière au Boeuf that the French had encroached into territory claimed by the English. 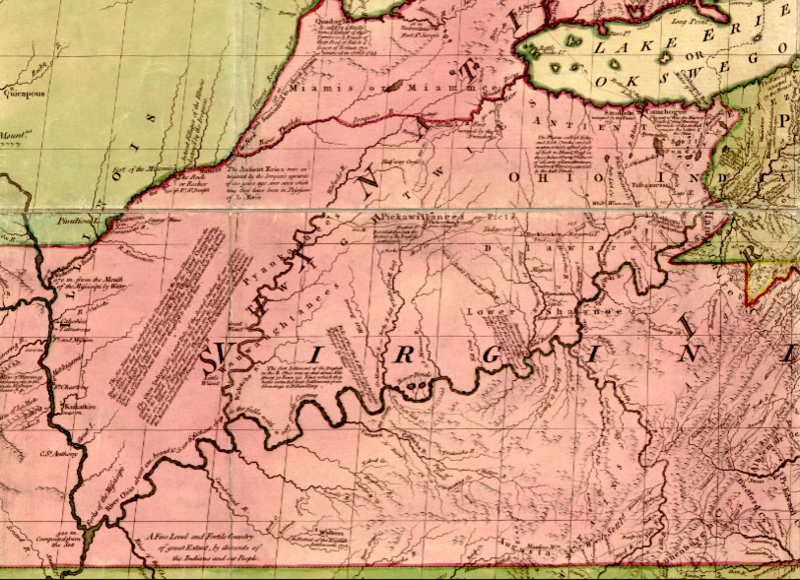 Part of the English claim to the Ohio River territory was based on the 1744 Treaty of Lancaster. After the Iroquois supposedly "sold" their claim to that land, the Ohio Company obtained a land grant to much of what is modern-day Ohio. After Lord Dinwiddie gave Washington the assignment to travel to Fort Le Boeuf, Washington hired Christopher Gist to serve as his guide. Together with Indian allies, the two Virginians reached the French headquarters near Lake Erie (modern-day New Waterford, Pennsylvania) despite the November snow and ice. Washington was treated well by the French at Fort Le Boeuf. The officers must have appreciated the opportunity to converse with a "gentleman" in the middle of nowhere - but they rejected Dinwiddie's claim that the Ohio River was British territory. Washington's tiny party in 1753 was clearly inadequate for anything more than a brief scouting expedition, and to the French any military threat from Williamsburg must have seemed minor. The French were more concerned with the Native American allies that accompanied Washington and Gist, and worked hard to shift the Native American loyalties to the French. Washington hurried back to Williamsburg from Fort Le Boeuf in order to alert Dinwiddie as fast as possible, surviving a dunking in an ice-filled river and an attempt to kill him by a Native American in his traveling party. Washington submitted a written report to Lord Dinwiddie, who sent it to London. The report was published as The Journal of Major George Washington, and the 21-year old Virginian gained his first recognition in Europe through that report from the frontier. 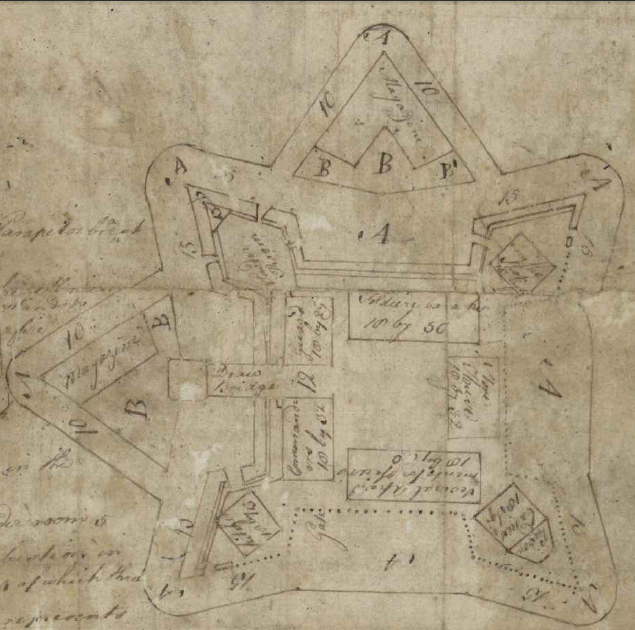 In 1754, the Virginia colony sent reinforcements to a fort that colonists were building at the Forks of the Ohio, to protect it from the French. 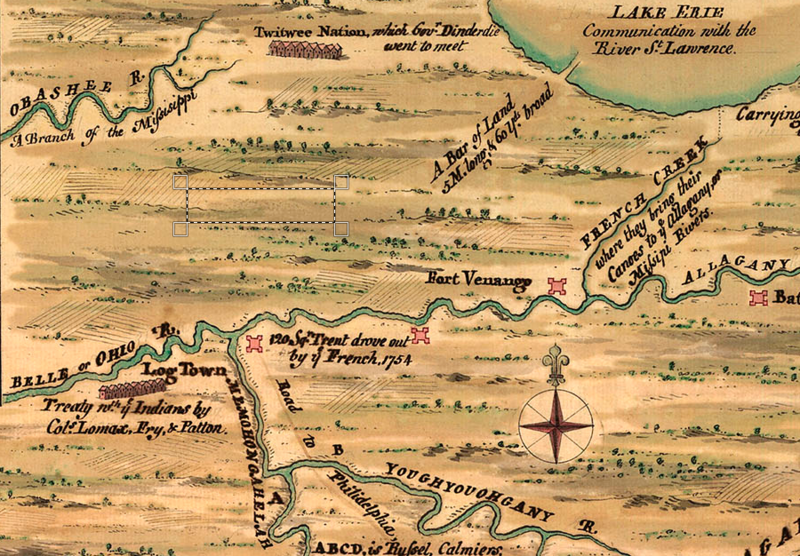 However, before the Virginians arrived, the French captured the fort and renamed it Fort Duquesne, one of several they planned along the Ohio River to connect "New France" in Canada with their holdings in Louisiana. Colonel Joshua Fry was the leader of the Virginia expedition, but Fry died before getting to Pennsylvania. The second-in-command, George Washington, assumed leadership of the military force - and led it into a debacle. After learning the fort had been captured and the Virginia colonists evicted, Washington attacked a group of Frenchmen in late May, 1754 while they slept. The site of the attack is now called Jumonville Glen, named after the French leader who died in the British ambush. After the Virginians had captured or killed all the Frenchmen, one of Washington's Native American allies took a hatchet and bashed out the brains of de Jumonville. This murder of the French leader, after he had surrendered, guaranteed continued hostilities between the Europeans trying to occupy the Ohio River valley. The French responded by sending troops and Native American allies from Fort Duquesne to confront Washington's small force. Washington failed to maintain good relations with his Native American allies, and they deserted the Virginians. Washington built a small fort with a palisade around it in an open field, called Fort Necessity, but was forced to surrender after less than one day of fighting. Washington signed a surrender document, written in French, in which he admitted to "assassinating" the French ambassador who had travelled from Fort Duquesne to meet with the Virginians. ...I am so little dispirited at what has happen'd, that I am always ready and always willing, to do my Country any Services that I am capable off; but never upon the Terms I have done, having suffer'd much in my private fortune, besides impairing one of the best of Constitution's. I was employ'd to go a journey in the Winter (when I believe few or none wou'd have undertaken it) and what did I get by it? my expenses borne! I then was appointed with trifling Pay to conduct an handful of Men to the Ohio. What did I get by this? Why, after putting myself to a considerable expence in equipping and providing necessarys for the Campaigne I went out, was soundly beaten, lost them all--came in, and had my Commission taken from me or, in other words my Corn'd, reduced, under pretence of an Order from home. I then went out a Volunteer with Genl. Braddock and lost all my Horses and many other things, but this being a voluntary act, I shou'd not have mention'd it, was it not to shew that I have been upon the loosing order ever since I enter'd the Service, which is now near two year's; so that I think I can't be blare'd, shou'd I, if I leave my Family again, end'vt. to do it upon such terms as to prevent my sufferg., (to gain by it, is the least of my expectation). What today we call the French and Indian War may have been inevitable, once two European powers sought control over the same Ohio River land. The war was triggered by the actions of the military force led by Washington in 1754, but had Washington not been in charge of the Virginia response to the French incursion then a war would have been triggered by some other incident in the 1750's. The war was inevitable... but the role of the Virginians was not. Why were the Virginians fighting the French so far from the boundaries of the Virginia colony? Jumonville Glen, Fort Necessity, and Pittsburg (Fort Duquesne/Fort Pitt) are all in Pennsylvania - why didn't the Pennsylvanians fight the initial battles? Land-hungry Virginians in the General Assembly and on the governor's Council launched the Ohio Company in 1748. The average Virginian without a massive land grant shared the hunger for land, and was willing to fight Native Americans, the French, or even Pennsylvanians to obtain cheap land. 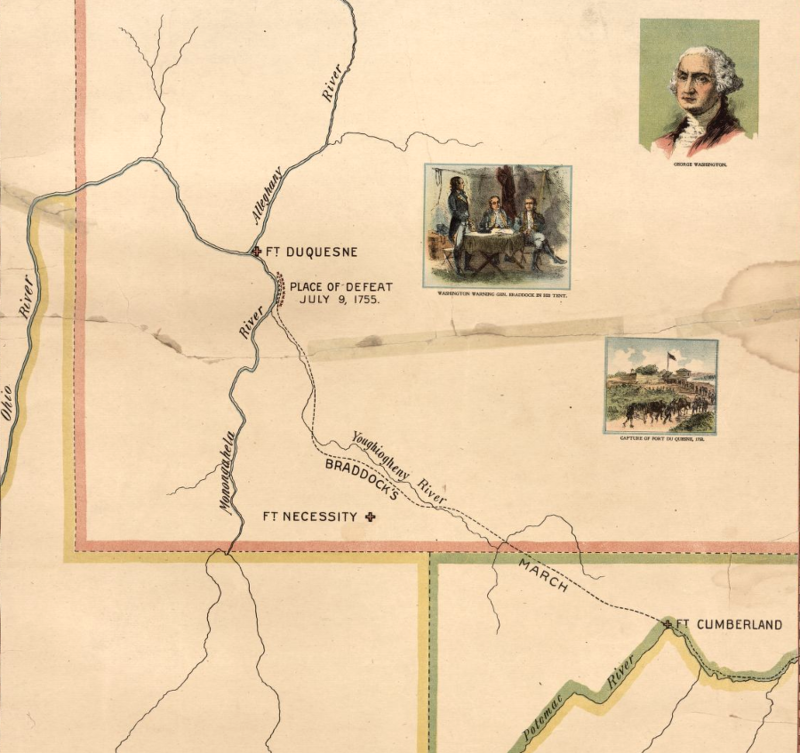 The Quaker-led assembly in Pennsylvania lacked the avarice and willingness to fight for land. The Virginians saw an opportunity to gain control over the Ohio territory, and had no qualms about citing the colonial charters as the basis for their land claims or raising an army to fight for that land. When Lord Braddock arrived in 1755 to lead the British army to the capture of Fort Duquesne, he established his base of operations in Alexandria - not Philadelphia. Farmers bringing crops and other supplies to Braddock created "Braddocks Road" in Loudoun and Fairfax counties, but Braddock marched up modern Route 7 and through Maryland to what is today Cumberland, Maryland. From Cumberland the English cut a road through the wilderness to Fort Duquesne. However, Braddock was killed and the British defeated in a surprise assault by the French and their Native American allies near the fort. Much to the dismay of the Virginians, however, the British forces moved to Philadelphia after Braddock's defeat and went into "winter quarters" in mid-summer of 1755. 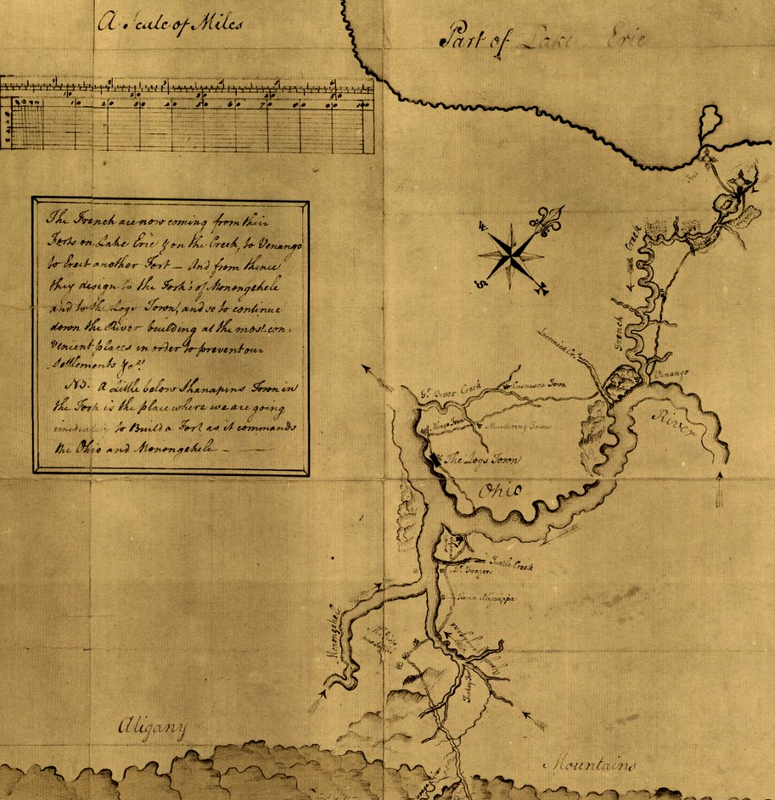 Even worse, the British determined to attack Fort Duquesne by building a road through the Pennsylvania wilderness, enhancing the economic link between Philadelphia and the Ohio River in the process. After the British captured Fort Duquesne and renamed it Fort Pitt, the Virginia investment in fighting the French ended up providing advantages to the Pennsylvania colony rather than to Virginia. 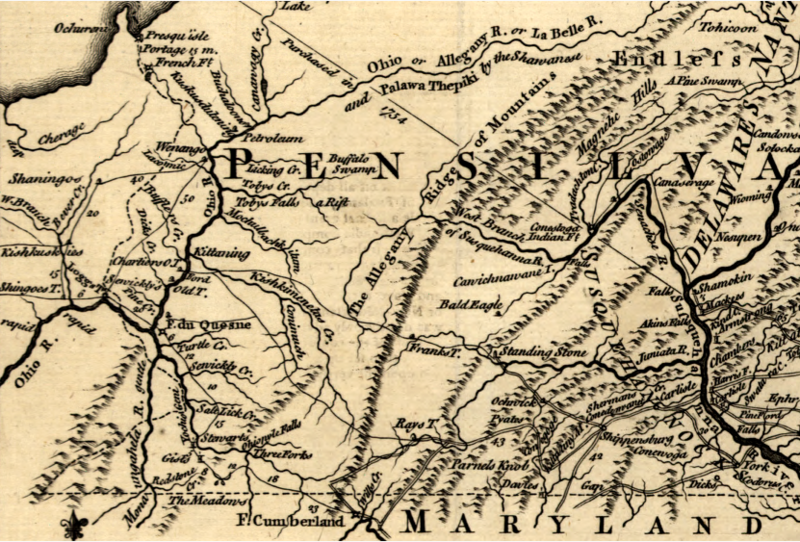 The Virginians even dropped their claims to the land in southwestern Pennsylvania, though the land claims already established by Virginia colonists were confirmed by the Pennsylvanians. 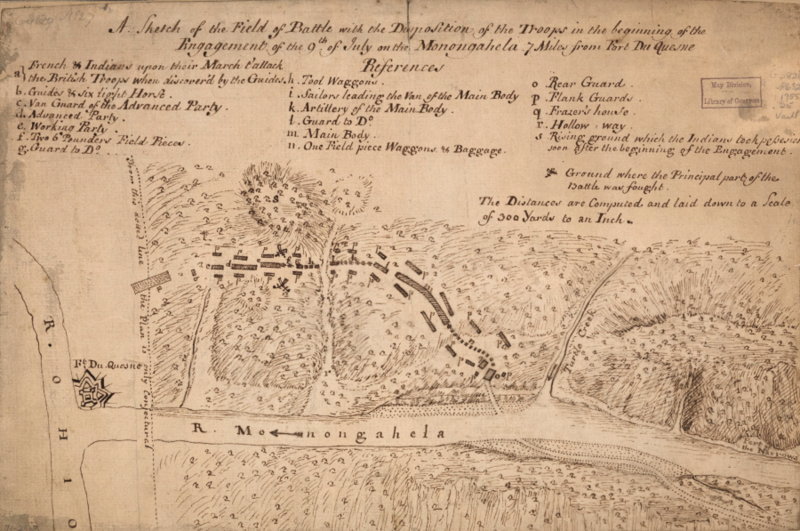 Source: Library of Congress, A sketch of the field of battle with the disposition of the troops in the beginning of the engagement of the 9th of July on the Monongahela 7 miles from Fort Du Quesne.